Good afternoon friends! Ali here with my first card for April. As you know our challenge this month is Clean and Simple so today I am featuring this beautiful little dragonfly from the Hero Art Set: Mason Jar Bugs. This month’s Collaboration partner is the adorable Newton’s Nook. Their stamps are just so cute and I will be back later this month to show you my card featuring the goodies the have shared with us! If you have some time, we’d love to have you join our challenge! Kathy, The Crafty Nurse here with you today for my take on a this month’s “Clean & Simple” challenge going on all month at A Blog Named Hero. This month we are collaborating with Newton’s Nook so you’ll definitely want to join. I am not typically a Clean & Simple designer so my interpretation may be a little less Clean and Simple but that’s okay because what is important is your expression of the challenge. For my card I began by creating a background with Candied Apple Distress Ink then lifted the design with a Dylusions Stencil and water. I then stamped the Hero Arts Leafy Vine over the panel and included the Newton’s Nook sentiment. 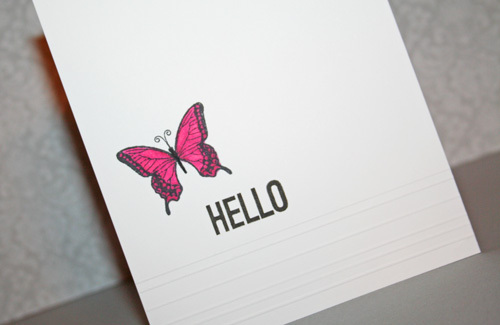 The butterflies are colored with Zig Clean Color Real Brush Markers and glittered with Wink of Stella Clear. For your connivence, we’ve added the current challenge to the side-bar on the right over at A Blog Named Hero so you can find it quickly to enter. We can’t wait to see your “Clean & Simple” cards this month. Have fun! It’s Steph here and today I have a card set to share that goes along with our last challenge that just recently ended, which is to clean up your act and create a clean and simple card. 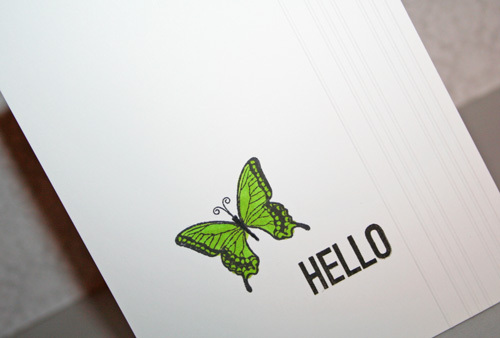 When I think of clean and simple, I usually think of a white card base with minimal elements. And I have discovered that one of the best ways to add a little bit of texture to a card without adding bulk is to use a scoring board. 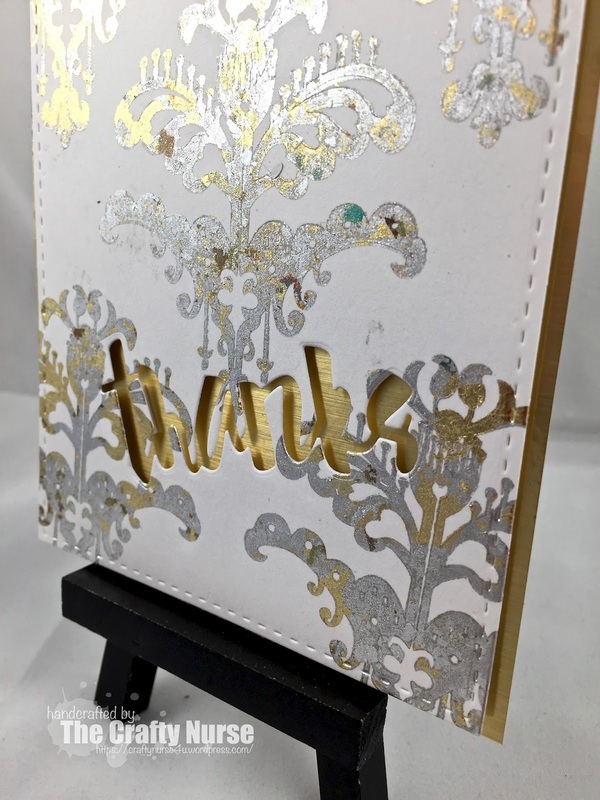 For my card set, I added different patterns of scoring lines using my Martha Stewart scoring board and then added some stamping to finish them off. 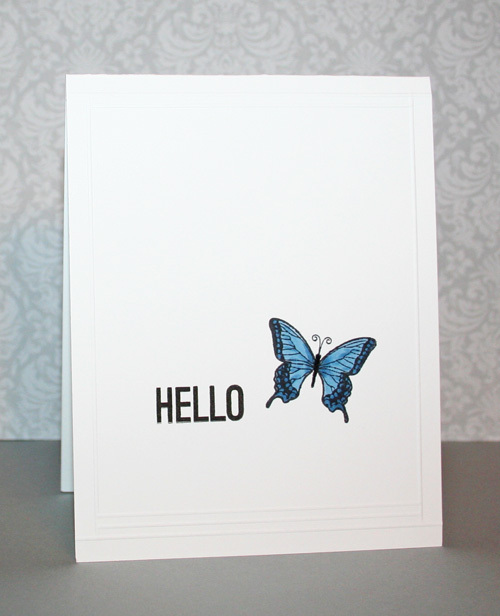 Each card uses the same 2 stamps (the Hello sentiment and the butterfly) but they are all positioned differently depending on where I added the scoring lines. It’s Simone here today sharing some quick clean and simple Halloween cards with you all. If you’re anything like me, then you have hoards and hoards of patterned paper in your stash that rarely gets used! So I decided to pull out some Halloween themed PP and use them in some cards to create a fun matching set. For this witchy card I just cut some strips from my patterned paper and adhered it along the bottom of the cardstock panel after stamping the image and sentiment. To change it up a bit I layered banners of patterned paper across the top of this scary kitty card. And lastly I added a strip of patterned paper down the side of this Dancing Skeleton card before adhering the image onto the card base using some adhesive foam. On all of the cards I also embellished them with matching adhesive rhinestones. This will be my very last post for A Blog Named Hero, as I’m stepping down to get ready for the upcoming birth of my twin girls in December, so I just want to take this opportunity to thank you all for your wonderful support and comments and also give a huge thanks to this amazing design team. You girls are a talented and sweet bunch and it has been so nice working with you all. Also I want to give a huge thanks to both Mary Dawn and Linda for running an amazing DT and making everything fun! I will definitely be checking back in regularly to see all of your wonderful creations! Hi, Stampers! Lisa here, with my first-ever photo tutorial! 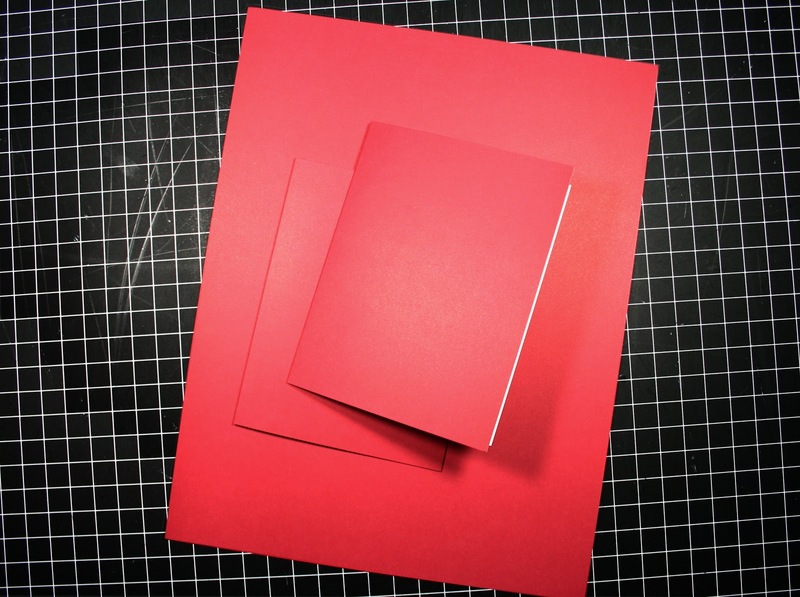 In keeping with the current ABNH challenge, I have a clean & simple (CAS) holiday card that would be very quick, easy, and economical to mass produce. Please bear with me, as the photos were taken at night and my exposures were a bit wonky. Here is my card! Like I said, super simple and easy, and best of all, super economical to make AND send. 😉 With just a couple of layers and no 3D embellishments, there’s not extra postage required. 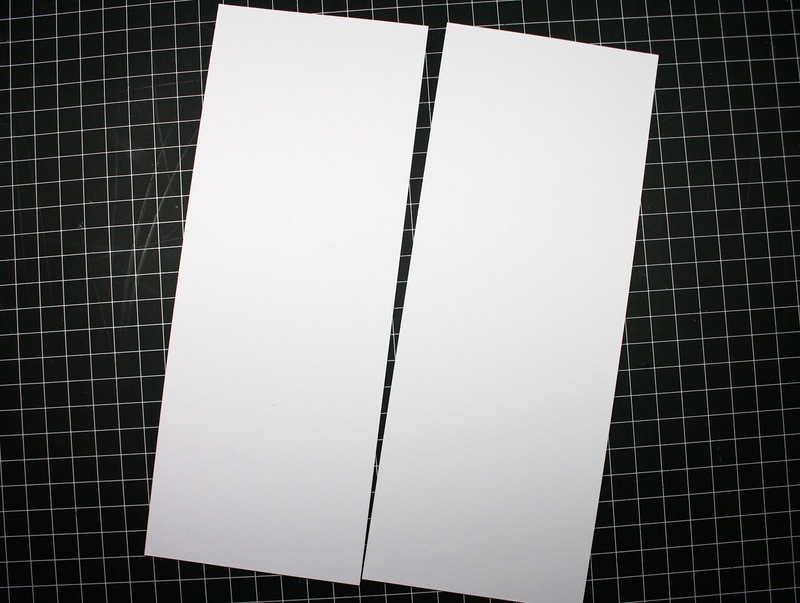 Step 2: Take a piece of 8 1/2 x 11 white card stock, and cut it in half lengthwise….. Step 3: Now.. here, you can use an 8 1/2 x 11 piece of gold metallic/shimmer paper, but I didn’t have any, so I just used an additional piece of regular white card stock. 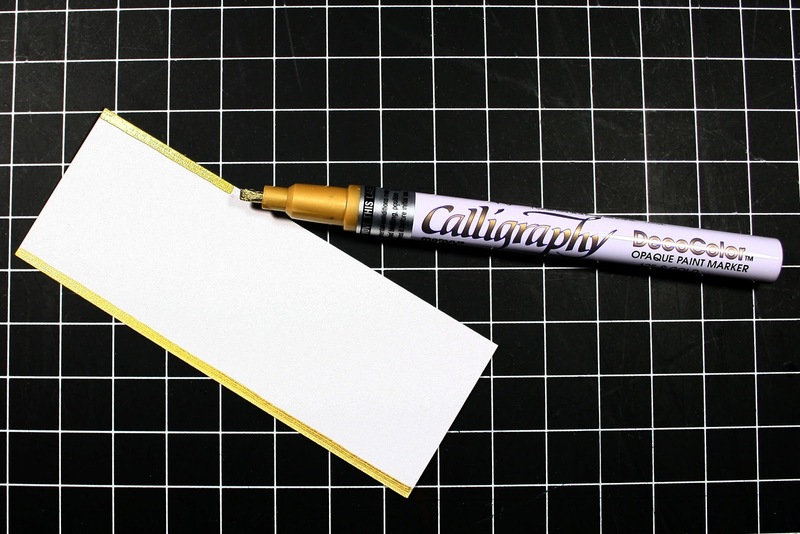 In a later step, I’ll show you a trick on how to make it appear as if it’s more expensive, gold metallic paper. 😉 So once again, cut your 8 1/2 x 11 card stock in half lengthwise, but this time, cut the pieces into 1 5/8 inch strips. You’ll end up with 12 identical pieces that are 1 5/8 x 4 1/4 inches. These pieces are slightly wider than your first, and will be the mats (discard the smaller ones, shown at the bottom of the photo). Set these aside for now. 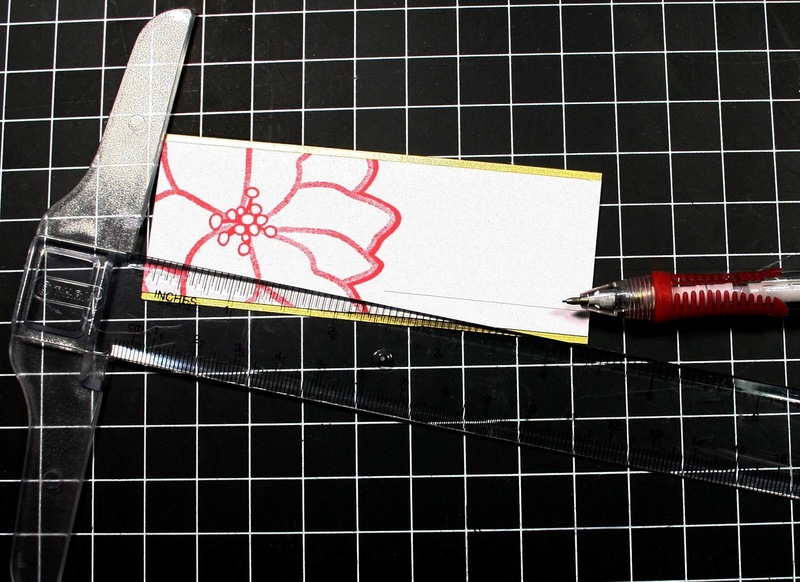 Step 4: Take one of the smaller, 1 1/2 x 4 1/4 inch strips and just lay it on the lower half of your card front… DO NOT adhere, this is just for placement. 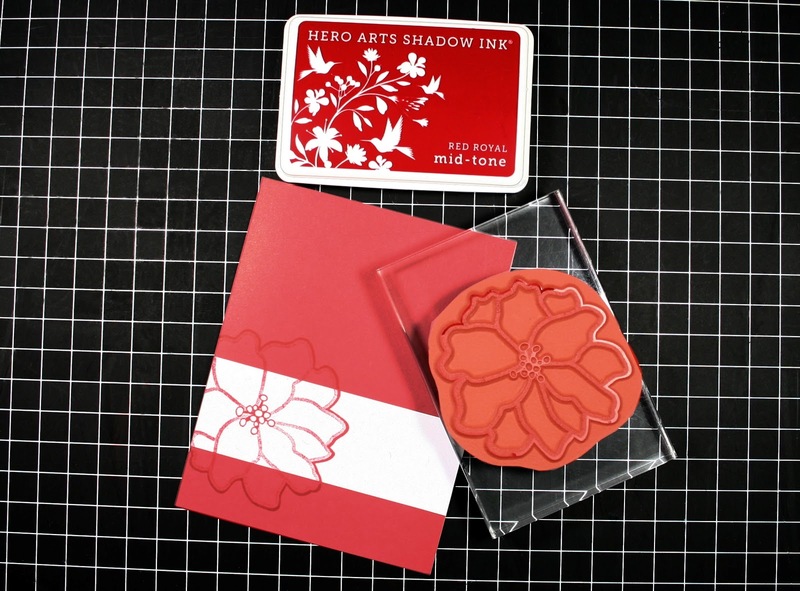 Then ink your poinsettia image with red ink and stamp directly on top of the white panel AND the card front together, slightly off the folded edge. 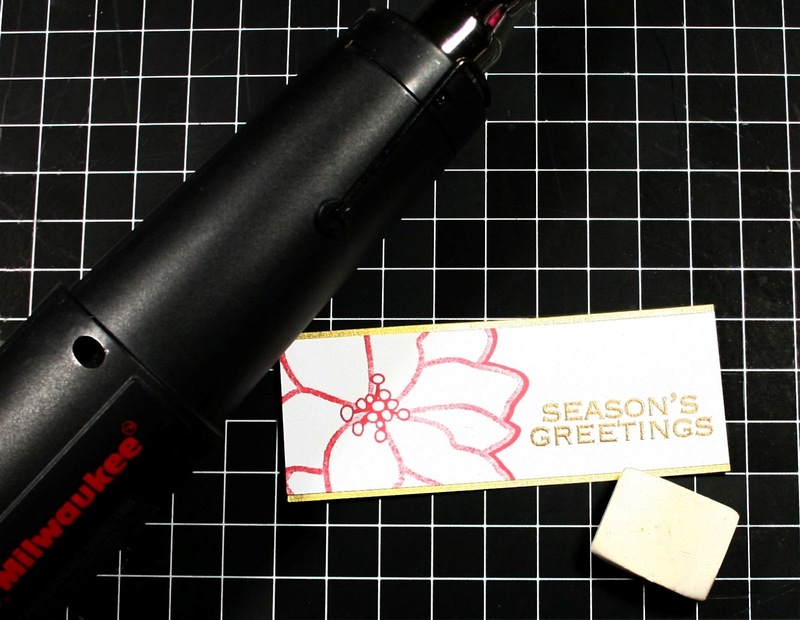 Aim to get the center of the poinsettia in the center of the white strip. There will be a bit of a gap in the image where the white panel meets the card base, but this will be concealed by our mat, shown next. 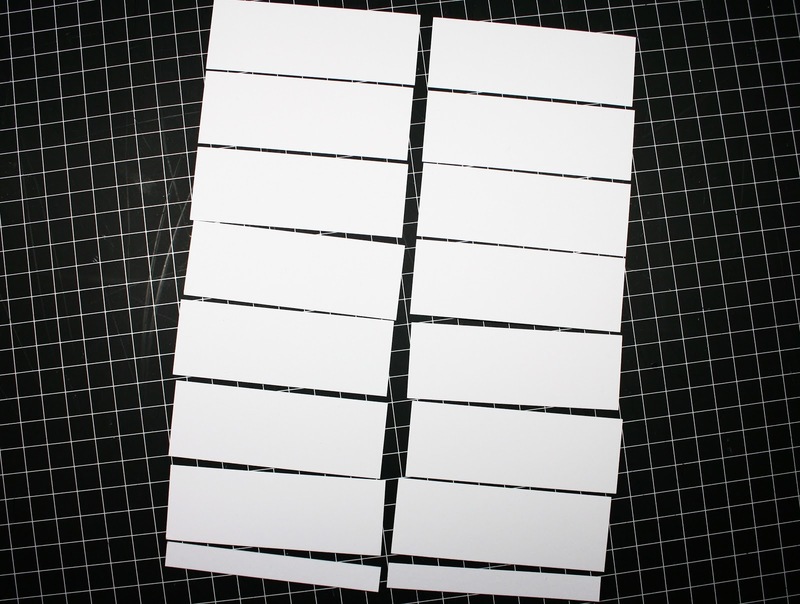 Step 5: Grab your larger 1 5/8 x 4 1/4 inch strips of card stock from Step 3. (if you used a piece of gold metallic paper for that instead of the white like I did, then skip ahead to step 6). 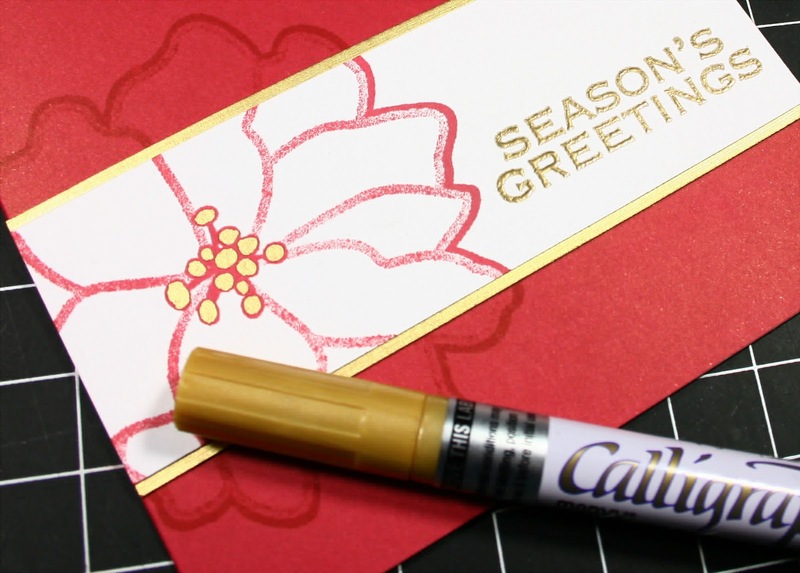 Using a gold paint pen or marker, just color the edges. Neatness is not a factor here, just make sure the top and bottom edges are well covered, at least an 1/8th of an inch in from the edges. Step 6: Adhere the poinsettia panel on to the larger gold-edged panel… your focal piece is now matted with gilded edges! 🙂 Then, using a T-square ruler, make a faint pencil line where your sentiment will go. 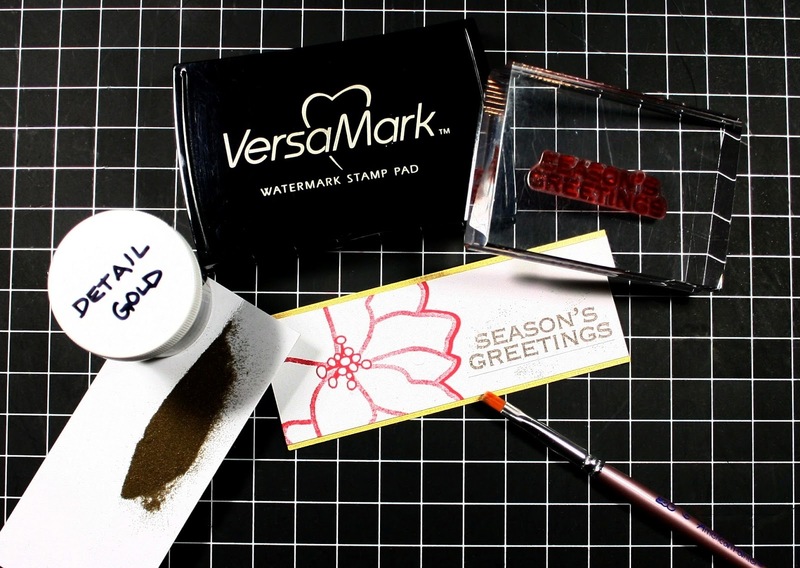 Step 7: Stamp your sentiment with embossing ink, and sprinkle on gold embossing powder. After shaking off the excess powder, I like to use a small, blunt-edged paint brush to get rid of any stray granules. Step 8: Heat emboss, and then erase your pencil line. And TAA-DAAH… the final card! I know it seems like there were a lot of steps, but I guarantee it all went VERY quickly… maybe 10 minutes per card! The design lends itself well to assembly-line-style mass production. 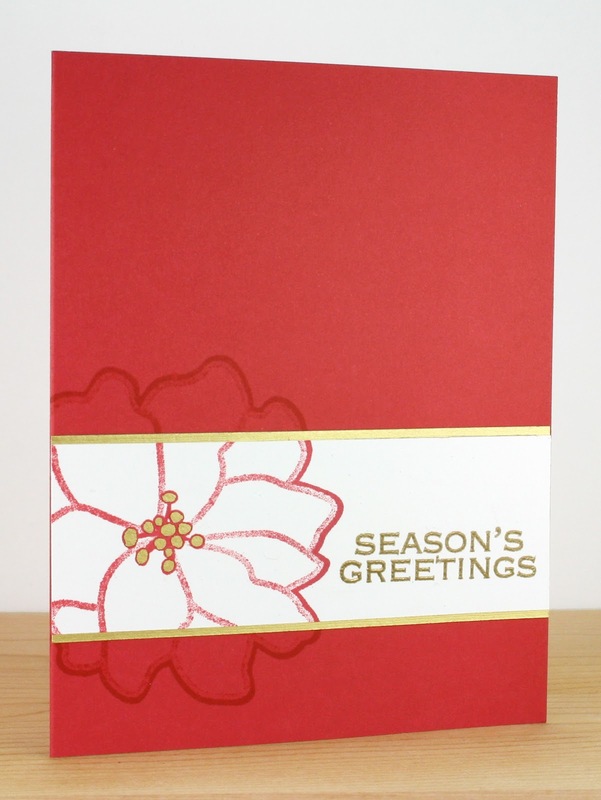 It also has minimal layers and no bulky embellishments or pop dots, so it’s super easy to mail. 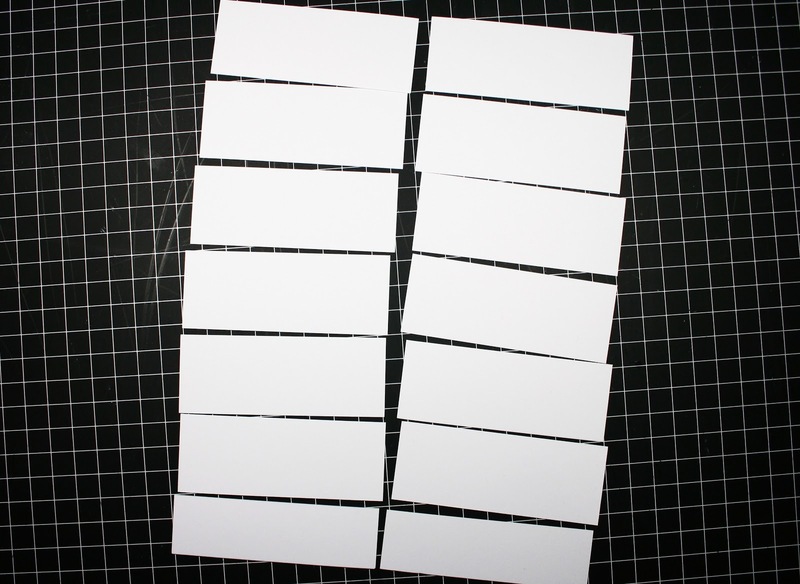 And remember in steps 2 and 3 when we cut that white card stock into several pieces? Well, just think… each one of those will go on one card front, so you basically have enough for a dozen cards, making this design very economical as well! I hope you enjoyed my tutorial… thanks in advance for going easy on me. 🙂 And I hope this helps you in your holiday card making! If you have any questions at all, just leave them in the comments section and I’ll be sure to answer as soon as I can! 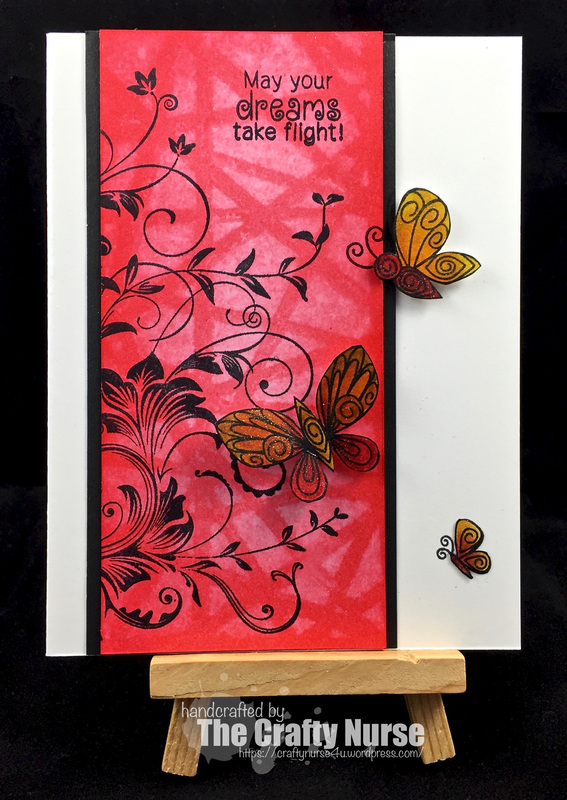 Don’t forget that our Clean & Simple challenge is still going on HERE… happy stamping, friends!